Show your #TrolleyLove and take a ride on the City of Newnan trolley, a FREE fixed route service that is accessible to all, and is offered by the City of Newnan. Riders are able to explore Downtown Newnan shops, businesses, restaurants and Ashley Park between the hours of 1:00 p.m. to 8:00 p.m. The trolley has stops at Newnan City Hall, Ashley Park's "The Green" and the Governor Ellis Arnall Parking lot. For more information, click here. Emerge yourself in the city's art scene by taking a selfie or two in front of our city's various murals around the City. Don't forget to tag us using #NewnanGA on social, for the chance to be featured on the city's social media! Be on the lookout for a unique partnership with Keep Newnan Beautiful, local businesses and schools to help fund environmental education expenses from April 22 through May 22, 2019. Join the Newnan Carnegie Library to celebrate Georgia Cities Week! This year's theme is True Colors, and the library will be making colorful prints using a paint and bubble mixture, which will make a unique texture for ages 3 and up! This event is great for children, teens, adults and homeschoolers! No reservations are needed. For more information, click here. Newnan City Council meetings are held the second and fourth Tuesday of each month in the Richard A. Bolin Council Chambers at City Hall. Agenda packet information is available on the City website or in the City Manager's office at City Hall beginning at 12:00 p.m. the Friday before each meeting. 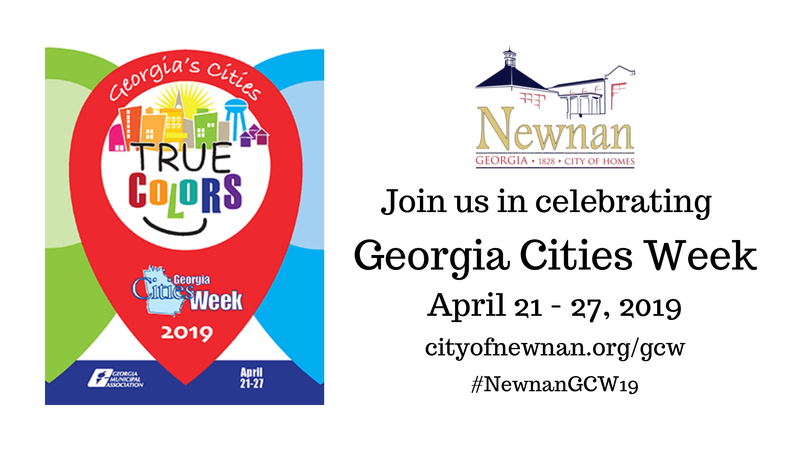 Show your #TrolleyLove and take a ride on the City of Newnan trolley, a FREE fixed route service that is accessible to all, and is offered by the City of Newnan. Riders are able to explore Downtown Newnan shops, businesses and restaurants and Ashley Park between the hours of 1:00 p.m. to 8:00 p.m. The trolley has stops at Newnan City Hall, Ashley Park's "The Green" and the Governor Ellis Arnall Parking Lot. For more information, click here. You're invited to climb the porch steps, cross the threshold and explore Newnan and its rich past in the historic Greenville and LaGrange neighborhoods. From gracious Italianites to cozy bungalows; featuring a beautiful variety of architecture and decor to delight and inspire. Homes on this tour have been locations for blockbuster movies and have a wonderful story to tell. This tour is not to be missed. For more information, click here. End Georgia Cities Week with your family and friends at Spend the evening at Greenville Street Park watching Disney's Mary Poppins Returns! Showtime starts at 8:25 p.m. Food vendors will be on-site.